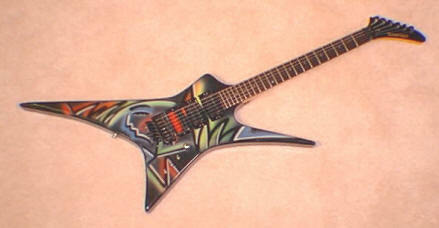 Ed Roman Version Built Neck Through The Body With Ebony Fingerboard. 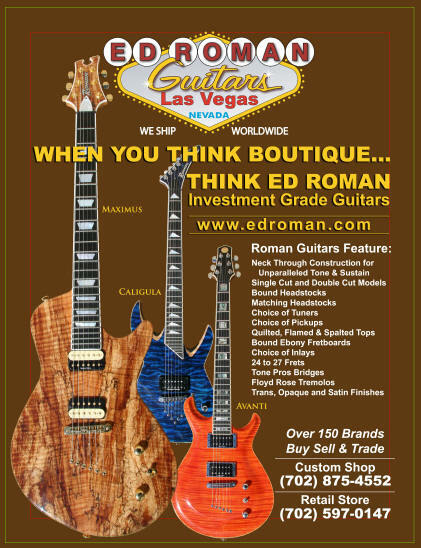 You can only tell it your children after you buy an Ed Roman Guitar !!! Maybe if you tell it to your wife, She will give you her permission to buy one. The story of the Adamantium Gold-tone Frets is a closely guarded secret. Ed Roman literally had to break into the 4th underground level of the Pentagon to acquire the chemical compound formula. He then had to construct a time machine to go back to the 40's to spy on it's inventor metallurgist Dr. Myron MacLain. Roman was obsessed to find out the secret of keeping the process of manufacturing stable enough to avoid destroying the planet into a cataclysmic vapor cloud. Roman surmised If he destroyed the planet, there would have been no customers left to purchase his guitars. He would have gone broke & died in the poor house!!!! To gain the necessary components he had to build a starship and travel 400,000 light years to the distant reaches of the Pulsar Galaxy to get enough raw materiel to build frets for his Abstract Guitar line. To do this in one lifetime he was forced to design the now famous "Abstract Equation" which he evolved from the Dymaxion Dynasty of ancient Egypt. Simply put the "Abstract Equation" creates a slight time shift in the universe allowing a network of black holes to open and shut in varying high speed sequences. This allows the traveler to travel incredible distances and actually get there before he left. To acquire a map of these endless pathways Ed had to use the time machine one more time and go back to ancient Greece, He had to scale Mount Olympus and gain an audience with Zeus, Using his incredible salesmanship and persuasive gift of gab. Ed Roman actually conned it out of Zeus, He promised to give Zeus the Golden Fleece, This was to the amazement of his wife Hera who said it was probably a Golden Fleecing !!!! She was just about to put a curse on Ed but he quickly parasailed off the top of Mount Olympus thereby avoiding her screams, vile epithets and of course the deadly curse. Adamantium is a virtually indestructible man-made steel alloy which does not occur in nature and whose exact chemical composition is a United States government classified secret. Adamantium is not an element: its properties do not qualify it for any known space on the Periodic Table of Elements. Rather, Adamantium is a series of closely related compounds of iron created through a secret process discovered by the American metallurgist Dr. Myron MacLain. Over the following decades MacLain experimented, attempting to duplicate the process that create the shield. Finally, in recent years, he succeeded in developing the process by which the substance known as True Adamantium is created. 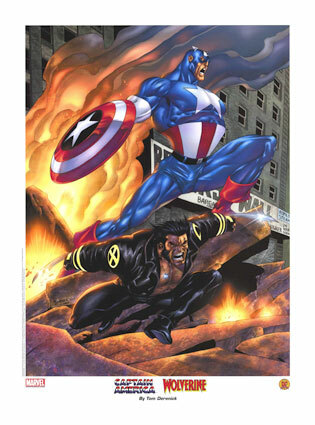 True Adamantium is nearly as strong as Captain America's shield, and is, for all practical purpose, indestructible. The degree of impermeability varies directly with the thickness of the Adamantium. A direct blow from Thor's hammer, conveyed with the thunder god's full strength, will slightly dent a solid cylinder of True Adamantium. A sufficient mass of Adamantium could survive a direct hit from a nuclear weapon. Adamantium is created through the mixing of certain chemical resins whose composition is a United States government secret. For eight minutes after the resins are mixed, the Adamantium can be molded into a particular shape as long as it is kept at a temperature of 1,500 degrees Fahrenheit. After this brief period the process of creating Adamantium is completed. The extremely stable molecular structure of the Adamantium prevents it from being molded further, even if the temperature remains high enough to keep it in liquefied form. Only a device called a Molecular Rearranger can alter the form of hardened Adamantium. The United States government has shared the secret of Adamantium's composition with certain of its allies, and the secret has also fallen into the hands of various criminals, such as the Constrictor, who has made special weaponry from Adamantium. Wolverine possesses artificial claws made of True Adamantium and his bones have been fused with Adamantium in an unexplained manner so as to greatly increase their tensile strength. The outer portion of the robotic body of Ultron is also composed entirely of True Adamantium, although Ultron's inner mechanisms are not. Adamantium is extraordinarily expensive to produce. Therefore, certain parties who wish to use Adamantium on a large scale have resorted to utilizing a similar but somewhat weaker compound similar to True Adamantium called Secondary Adamantium. Although Secondary Adamantium is still far stronger than even titanium steel, it can be destroyed by sufficiently great amounts of force. Blastaar's energy discharges and the vibratory force created by the Overkill Horn have both proved able to destroy Secondary Adamantium. The sentient computer known as F.A.U.S.T. had a casing made of Secondary Adamantium which Thor and Iron Man managed to destroy. The Red Skull and the original Hate-Monger had a dome of Secondary Adamantium constructed to protect their island fortress but the dome was destroyed by the vibratory force of the Overkill Horn and by powerful incendiary bombs. Ed Roman & his small band of merry men & crazed luthiers in their insane search for the most indestructible metal in the universe finally succeeded where all others had failed.